Reverb occurs when a sound hits any hard surface and reflects back to the listener at varying times and amplitudes to create a complex echo, which carries information about that physical space. 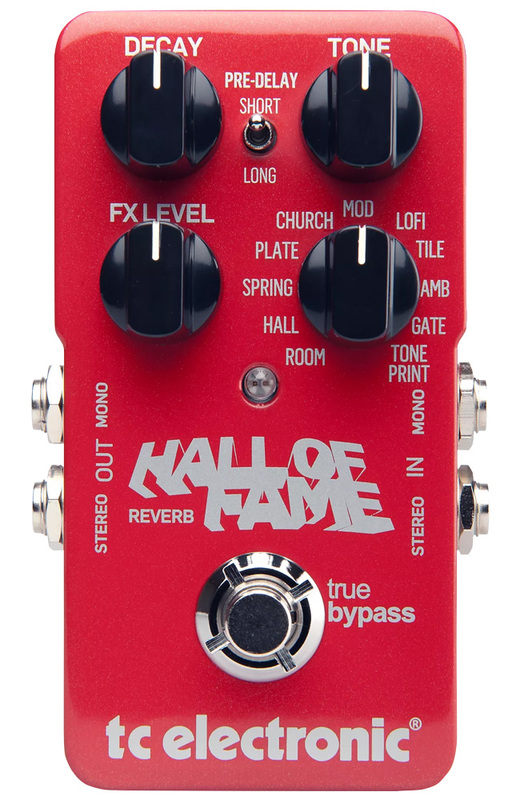 Reverb pedals or effects simulate or exaggerate natural reverberations. The earliest reverb effects from the ‘50s and ‘60s used relatively simple acoustic tricks. Plate reverb works by mounting a large (usually 4'x8') metal plate on spring clips and using the audio signal to vibrate the plate. Strategically placed contact microphones picked up the complex mosaic of vibrations to create a convincing simulation of a resonant room. Shortly thereafter came spring reverb, which also uses an acoustic trick. It became a standard feature on guitar amps in the ‘60s and can still be found in amps today. A transducer sends an audio signal down a length of coiled metal spring to a pickup at the other end. The vibration is created in the spring, and the diffusion of the signal down the length of the spring results in the effect. The effect ratio is the difference in volume between the direct, unaffected (dry) sound and the reflected (wet) sound the effect adds. Regardless of the amount of reverb, a higher mix of dry to wet will sound as though the instrument is closer to the listener, while the inverse “wetter” mix makes the instrument sound farther away. The decay time, or reverberation time, is the time it takes for the reflected sound to diminish to the point that it is no longer audible. Typically, this inaudible level is set at 60 decibels below the original sound. The decay time tells you the size of the simulated space. A longer decay time indicates a bigger room. The pre-delay time is the interval between the start of the direct signal and the start of the wet signal. It indicates the amount of space between the instrument, the reflecting surface, and the listener. Given that sound travels, on average, just a little under one foot per millisecond, a 200 millisecond pre-delay suggests the instrument (and the listener) are in the middle of a 100’x100’ room, since it is the same amount of time it takes for a sound to travel 100 feet, bounce off the walls and back to the microphone. The tone of the effect plays a part as well. Relatively low-energy higher frequencies tend to be absorbed by the environment sooner than the low-end, so the effect tends to sound darker and warmer than the instrument. To create an even more accurate effect, good reverb units will often have a tone control. When taken altogether, the effect ratio, pre-delay time, decay time and tone can simulate any sized room and make it sound as though the instrument is anywhere within that room. The difference between most of the menu options on a multiple-reverb effect—usually Room, Hall, Plate, Spring, Gate, Tile, Cathedral, etc.—can be understood as variations in the relationships between these four parameters.